A message from your friend. How are you? My name is Zeljko Runje. I work with Rosneft OIL Company Russia. I want to invest in your country. I need someone to deal with. Provide these below if you are interested. Note from the Author of this Article “ZaraTra”! or where you not know who is behind it. By virtue of my position I can influence recognition as a Sales representative to the Nigeria National Petroleum Corporation(NNPC). As a sales representative you authomatically become a commission agent to the corporation. When you are made a commission agent you will be given the Bonny Light Crude Oil Allocation to sell on behalf of the oil corporation and return the proceed to the oil corporation while retaining the commission. Working behind you as partner our gain will be the commission which we will make from the sale of the product. I am making this contact to you to seek your co-operation so that we can work together as partners to actualize the above goal. I cannot do it directly because issuing the crude oil allocation to myself will mean using my office for personal interest. That will expose me to prosecution as the law here does not permit that. The allocation that will be issued to you is confirmable at Lloyds of London and also at the NNPC’s sales depot in London. These are the two bodies that confirm crude oil transaction for all NNPC’s buyers. The confirmation will make every buyer see that the transaction is real and that you have legal right over the allocation. I am Mr. K. Yong-Yut from Thailand, I have plans to invest in your country in any profitable investment establishment that you can handle for me as my investment partner or manager. 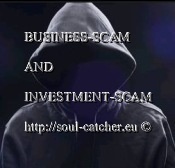 If you can help me receive and invest my money for me in your country as my partner or investment manager please get back to me through my personal e-mail for further discussions. I got your contact from chamber of commerce, I am Johnson Andrew, from England. I will like to share a business idea with you, I need your urgent assistance which will benefit both of us in terms of co-operation friendship and partnership. I work with ERA GLOBAL FARMING. I am contacting you to be our Supplier in Asia Pacific so that we can take advantage of a business opportunity in my company now. The business opportunity that I want you and me to take advantage of is that my company wants a product called ADAQUAN I.M RX/EQUINE. The only former supplier of these products to my company is in (Malaysia) as the marketing agent to KOON PETROCHEMICAL AND PHARMCEUTICAL OF NORTH KOREA. But due to the transfer of the Previous Pharmaceutical Supplier, the monopoly has been broken. Any company now can supply and merge into partnership with my company presently and this is the reason why am writing you seeking your interest for assistance. I just want you to act as an intermediary agent to stand the gap between the sellers (producers) and the buyers this is a big time business which will be of a good dividends to both of us I only need your co-operation to make these business a success. I will give you more information about this deal if you are willing to stand as the agent that usually supply to my company. Firstly I will like to secure a supply contract deal for you as a good agent in my company where I work based on percentage. Originally the actually purchasing price of these product by the company per carton is $11,500.00 US Dollars, while in (Malaysia) the local selling price is 5,250.00 US Dollars, and my company need more less than 250 carton, the reason why I want you to be our agent is because connecting the local seller in Malaysia directly to the buying company then the profit margin that both of us can easily be mute will be lost to the selling company, your major assistance for me is for you to talk to my manager that you can be our agent to supply our company the product, go in details in terms of price and mode of payment then we can pick up from that point. Get back to me as soon as you receive my email so that I can give you more details about the transaction. Note it is you that will determine the place where the transaction will be done so that my company shall arrive there for the purchasing of the product from you. Please contact me at once to declare your interest.